Sometimes it’s easy to look at the outdoorsy stuff other people do and think: “yeah ok, but I can’t trail-run/ cycle / climb”. But perhaps it’s not that you can’t, it’s more that you don’t – yet. Take this sea swimming thing. It’s something I mention a lot. But I haven’t been doing it that long – just a little over a year. This has been my first winter of wild swimming. It’s also not something I do at all well. I’m slow – very slow. I only do breaststroke, and I do that badly. And I wear a wetsuit; my band of all-weather swimmers don’t – ever (although they’re unfailingly polite about my choice). But although I swim slowly and badly, I swim joyfully – I adore the views, the people, the buzz and the stretches of shore you explore. It reminds me of a poster from the #ThisGirlCan campaign: of a real-sized woman jogging. And the caption? Still slow. Still lapping everyone on the couch. This year I’ve signed up for more swimming. 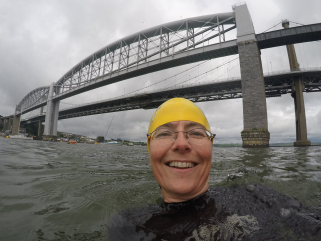 There’s my second Cross-Tamar Swim (for an account of the first, click here). And I’m down to notch up swims totalling 10km over June (not much, perhaps, but more than I’d normally do). And a friend and I are doing the Polkerris Biathlon (1.5km swim + 6km run). And we absolutely will be the slowest there. Fact. But you know what? We’ll be lapping everyone on the couch. So maybe spring is time to GetOutside. To turn an outdoors ‘can’t’ or a ‘don’t yet’, into a ‘maybe I can’. And although they are the hardest ones, it is really just about taking those first steps. Swimming not your thing (yet :-))? The Ordnance Survey has come up with plenty more tips on how to GetOutside – click here for its Beginner’s Guides. Sat March 5th, 2016. Plymouth, Devon. Air temperature: 9C. Sea temperature: 8C. Hot water bottle: toasty. For years now I’ve seen them, the swimmers wading into the water off Plymouth’s Tinside Beach. Whatever the weather, it’s a quick change on the shore then into the sea. In all seasons, in all conditions – they even swim during the big fireworks contest; jumping gleefully into inky depths as multi-coloured starbursts explode high above. In the summer I’m in there too; buzzing from swimming alongside Plymouth’s iconic shoreline: lido, lighthouse, warships – the water here is an unforgettable place to drink in the views. But come mid-October the cold defeats me. White hands and feet and uncontrollable shivering is not appealing. Until it dawned on me to do what now seems blindingly obvious: buy a wetsuit to swim in. Genius. So today, after a flurry of encouraging Facebook posts, I linked up with these awesome all-weather swimmers. I joined them for that quick change on the shore and that determined push into the sea. Now I know what it feels like: icy water seeps into my wetsuit, my neck and chin feel freezing. It is toe-curlingly, numbingly, strength-sappingly cold. But soon that cold-pain eases, laughter bubbles and conversations begin. We bob, watching people watching us from the shore. It’s joyful; liberating. After rounding two buoys, it’s time to head back to the beach – stoked and grinning. Numb hands turn to claws; socks become bafflingly difficult to put on. But even so there’s still a sheer, slightly-crazed sense of joy. Then it’s off to the Terrace Cafe for hot water bottles (bliss), coffee, cake and more chats. The sea might be cold but the welcome from these swimmers is gloriously warm. This swim was with the fabulous Devon & Cornwall Wild Swimmers, check their website for tips and events. Nationally, the Outdoor Swimming Society is a source of advice and inspiration. It’s website also features a Wild Swimming Map, and crucial safety advice (do read). Books on wild swimming include Kate Rew’s definitive Wild Swim. 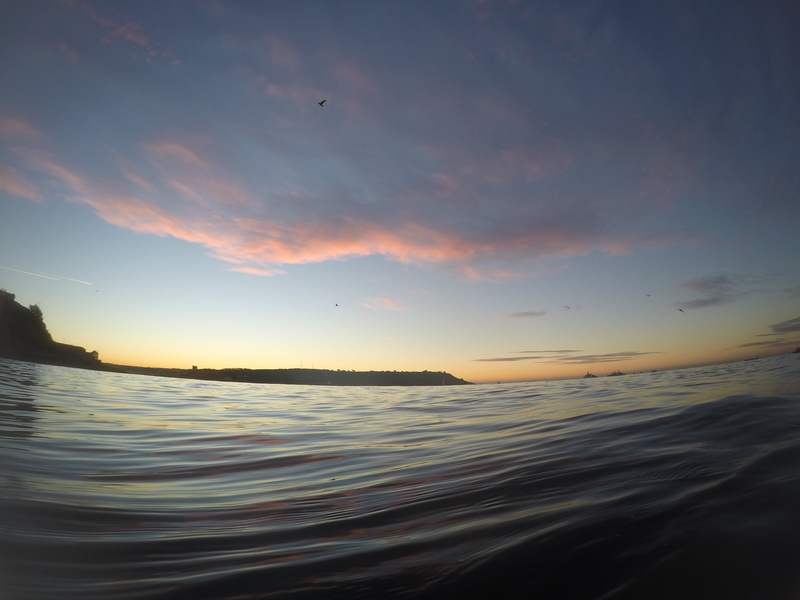 Southwest swimmers can dip into Sophie Pierce & Matt Newbury’s Beyond The Beach (the secret wild swims of Torbay). They’ve also written Wild Swimming Walks Dartmoor & South Devon.